This year, Russian officials have indicated that Moscow will provide some $4.5 billion to Crimea. They have also announced that some $7.2 billion will be taken out of the Russian pension fund to help cover the costs of annexation. These commitments are obviously yet one more burden on an already burdened federal budget, but they have helped ameliorate, albeit not negate, financial hardships for much of the region’s population. Those hardships have been considerable, including widespread disruptions of everyday life. Most ATMs have stopped working, and many cell phone operators, including Russia’s largest, MTS, no longer serve the region. Ukrainian and most foreign (other than Russian) banks no longer operate on the peninsula (for example, PrivatBank and Oschadbank, two of Ukraine’s largest banks, have each closed some 300 branches). Western credit cards no longer work, and although Moscow has announced plans to compensate some savers, there are limits on the amount of compensation and delays in implementation. GDP has also been hard hit, and Crimea was a poor region of a relatively poor country even before the current crisis (see Figure 1). Production and supply networks have been disrupted, particularly those involving Ukraine proper and the EU. In June, the EU banned all imports from Crimea. Some large industrial enterprises, particularly those owned by ethnic Ukrainians or non-resident Ukrainian citizens, have gone under or are in trouble. Small- and medium-sized businesses have been harmed by the lack of credit, and many have shut their doors. Western companies have been compelled by Western sanctions to leave, and sanctions have also forced Russian banks and other businesses to try to reduce exposure to sanctions by operating in Crimea through subsidiaries. The net effect of all of this has been lower incomes and significant job losses across the peninsula, with most of those out of work unable to find alternative employment. After the annexation, Moscow took control of all entities owned by the Ukrainian government. The transfer of ownership, and the need to replace some of the officials who had been responsible for administering those assets, has been disruptive. There have also been many reports of long lines and delays for passports, export licenses, driver’s licenses, and so on. Crimea’s tourism sector, which along with agriculture is the most important sector of the Crimean economy, has been hit particularly hard. According to Crimea’s Minister of Resorts and Tourism, 3.5 million tourists will have come to Crimea by the end of 2014, down from 5.9 million in 2013 and less than half of the over eight million per year who came in the late Soviet era (see Figure 2). Nevertheless, the fact that commercial flights came only from Russia this summer, as well as the war in eastern Ukraine and the shooting down of MH-17, led to a dramatic decline in Western visitors to Crimea as well as Ukrainians. Moscow launched a post-annexation campaign to encourage Russians to show their patriotism by vacationing in the region, and it directed its State Agency for Tourism to ensure that at least three million tourists from Russia visited Crimea in 2014. To that end, Aeroflot offered highly discounted flights from Russian cities to Crimea over the summer. It also tried to establish a budget airline offering flights from Moscow to Simferopol, but the company quickly collapsed, blaming EU sanctions against Russia for its failure to launch. Aeroflot recently announced that its discounts on regular flights to the peninsula were ending, presumably because they were losing money on the flights. It is still possible, however, to get to Crimea from Russia by land. Kyiv has closed neither the border with Russia nor with Crimea. But the route obviously goes through Ukraine, and it is even slower that it was before the war. Trains take over 24 hours, and driving has been made difficult and expensive, especially now that fighting has blocked the southern route along the Sea of Azov. According to Google maps, driving non-stop from the Russian city of Belgorod, just to the north of Kharkiv, to Simferopol, takes 10 hours under normal circumstances. Doubtless delays at the Russian/Ukrainian and Ukrainian/Crimean borders, along with traffic disruptions caused by the war, means that the journey takes even longer now. 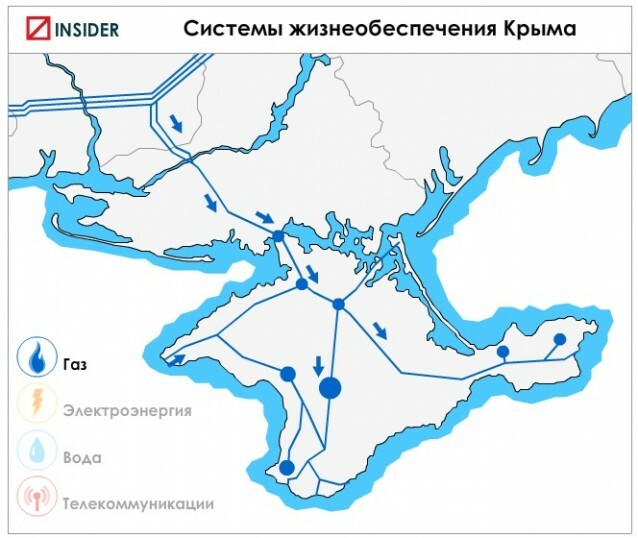 Many Russians are in any case afraid to pass through Ukraine under current circumstances, preferring to fly or to cross the Kerch Straits by ferry (see below). Finally, Crimea is going to continue to compete with Sochi as a Black Sea destination for Russians, and Sochi also had a disappointing tourist season after the end of the Winter Games. None of this suggests that a surge in Russian tourism is going to compensate for the dramatic decrease in tourism from elsewhere. Production and employment are, however, for the most part medium to long-term challenges for Moscow. The short-term problem is to ensure that the civilian population gets through the winter without too much hardship. Prices for consumer goods, particularly for food, have increased significantly, and there are concerns about shortages over the winter. The peninsula produces its own vegetables and grains, but it imports meat, dairy products, and sugar, inter alia, most of which came across the administrative border with Ukraine proper in trucks or trains. Some of that food was produced in Ukraine, but some came from the West. While food produced in Ukraine is still being imported, the latter is no longer legal because of Moscow’s ban on food imports, including meat, from the EU, U.S., Canada, Australia, and Norway. Already, the peninsula has been experiencing shortages for some food products, despite the fact that Kyiv continues to allow food to cross from Ukraine by truck and rail. Were Kyiv to close the border, it would be difficult, and expensive, for Russia to make up the difference with deliveries by sea and air. Meanwhile, local officials have severely restricted exports of meat, sugar, flour, and other foodstuffs, including to the Russian mainland. And they have ordered retailers to reduce profit margins for basic foods to 10%. As for energy, Crimea is fortunate in having significant natural gas reserves, and it appears to have adequate supplies for the winter, in part because it has been pumping record volumes into its only underground storage facility. Moreover, as a peninsula on the Black Sea, Crimea has a more temperate climate than most of the rest of Ukraine, so it is less vulnerable to spikes in gas consumption for heating should the winter prove unusually harsh. The peninsula is, however, dependent on Ukraine for much of its electricity. Prior to annexation, Ukraine supplied the peninsula with between 60 percent and 90 percent of its power, depending on demand and variation in local production, which comes mostly from solar- and wind-powered generators and is thus effected by weather conditions. Ukraine has cut back on power supplies but not halted it entirely. Peak demand is around 1,000 megawatts (MW), but Ukraine’s state-owned electricity company Ukrinterenergo announced in September it would limit deliveries to 300 MW in the morning and evening, 500 MW during the day, and 600 MW at night. Moscow has responded by providing gas-fired mobile generators that can provide up to 700 MW for a limited period. Nevertheless, there have been occasional brownouts and blackouts on the peninsula. Were Kyiv to cut off deliveries entirely, particularly during peak demand or in adverse weather conditions, there would be more, and particularly painful and costly, brownouts and blackouts. Crimea also imports significant quantities of coal, all of which came by train from Ukraine before annexation. The coal is used for boilers serving businesses and households – in the latter case, around one-quarter of the region’s total – many of which are in hard-to-access rural areas. According to a November 11, 2014 article in The Financial Times, Crimean officials are particularly worried about coal shortfalls over the winter as demand increases and transportation is interrupted by bad weather, particularly if a cold spell freezes the Kerch straits. 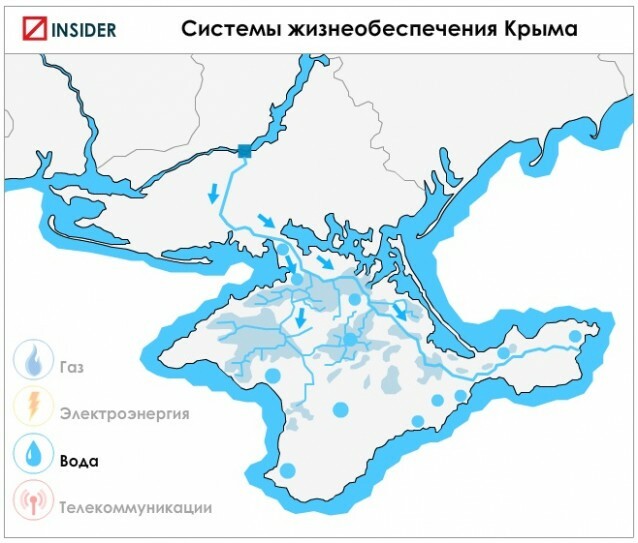 While less acute during the winter when agricultural needs are minimal, Crimea is dependent on Ukraine for between 80% and 85% of its water consumption, most of which comes through the North Crimean Canal from Kakhovsky Reservoir on the Dnieper. Again, Ukraine has reduced the supply of water to the peninsula but it is still delivering some, despite the fact that Kyiv announced in April that it was cutting it off. Nonetheless, there are reports that drinking water is becoming a problem as reservoirs fall below safe levels, including in Sevastopol, where water for residences is already being rationed. Obviously, Moscow’s plans for improving living conditions and integrating Crimea into Russia proper are greatly complicated by the absence of a land corridor from the Russian mainland. Federal authorities have announced plans to build a bridge across the Kerch Straits at a cost, according to Russia’s Minister for Crimean Affairs, of over $5 billion. Transportation links from the Russian side of the straits to Russia’s main roads, train tracks, and infrastructure will also have to be improved, particularly for winter conditions. Crimean authorities also worry that bridge traffic will be interrupted for a month or more by winter storms, and they have advocated building a tunnel instead. To my knowledge, Moscow has not responded favorably to the suggestion, presumably because federal authorities think it is impractical. If Moscow goes forward with a bridge, it will in any case not come into service until 2018 at the earliest, which means Crimea will face four winters before a bridge ameliorates supply problems. Meanwhile, ferry services from the Russian mainland at Port Crimea and Novorossiysk (see map) have been operating at maximum capacity but have been unable to handle the traffic effectively. Journalists reported that it was typical for passenger cars to wait four hours and sometimes as long as 24 hours to board a ferry over the summer, while trucks often waited several days. The Financial Times reported that at the end of last month, there was a queue of 300 trucks waiting for the ferry to Crimea, and 500 trucks on the Crimean side waiting to return. These delivery bottlenecks have increased shortages as well as transportation costs for exports to the Russian mainland, further undermining profitability for Crimean exporters. And while passenger demand will decline in the winter, truck crossings will likely increase as food and fuel needs grow, even as ferry service becomes disrupted by adverse weather. The key challenge for Russian and Crimean authorities over the winter, then, will be to ensure adequate supplies of food, coal, and electricity. This will be a logistical challenge, and expensive, for Russia even if the border between Crimea and the mainland remains open and Ukraine continues to allow trains and trucks from Russia to cross Ukrainian territory. If Ukraine closes the border with Russia (unlikely) or Crimea, or if it halts deliveries of electricity, coal, and food, that logistical problem will be worse – and even more expensive for a Russian economy already under very considerable stress.